Use your hanging baskets over and over again by maintaining them with the Premium Flat Coco Fiber Liners. Using liners in your baskets not only helps soil stay tidy, it also aids in retaining moisture for a healthy and lush garden. The innovative, flat design of these liners allows them to be placed into 16" diameter baskets of varying depths. Four slits on the unit allow it to curve and overlap when placed into a hanging basket, offering a perfect fit. The brown color and natural fibers will easily enhance your flowering plants or vines, and the package makes it simple to care for an entire garden at once. Maintain your hanging baskets with ease using these Premium Flat Coco Fiber Liners. 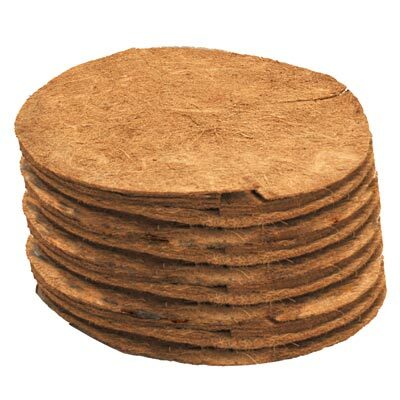 Note: This case pack includes 48 Premium Flat Coco Fiber Liners, 16" diameter. Premium Flat Coco Fiber Liner, 16" dia.